This photo means the world to me for many reasons. 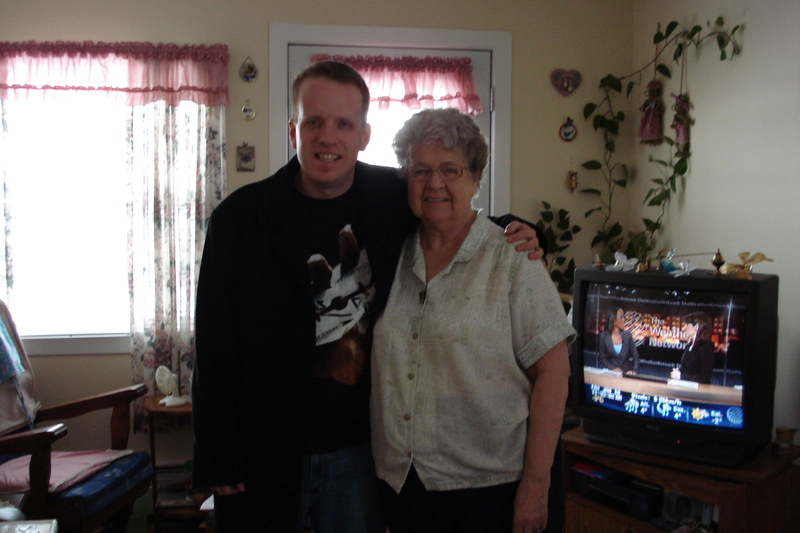 It is the last photo I would ever share with Nan. My writing is drawn from a ton of different influences. Some of which that wit (or lack thereof) comes from my devotion to irreverent humour from Britcoms and British Sketch Comedy pieces. One of my closest associates introduced me to the brilliance of Monty Python, but it was Nan who introduced me to the brilliant writing of Roy Clarke. Clarke is the man responsible for the brilliant situation comedy “Keeping Up Appearances. This great show featured the wonderful Patricia Routledge with a cast of other brilliant talents. There were a few nights where I would crash over at Nan’s for one reason or another. Likely cause I was driving my mother up the wall although she might not admit to that. If I came over and it was late and maybe wanted to crash out, she was adamant that I not go to sleep until I watched “Keeping Up Appearances” and “Are You Being Served?”. While I quite enjoyed both shows, I felt a strong connection to Keeping Up Appearances because I felt the character dialogue was so perfect. This kind of situation comedy writing has a cross-reaching appeal to many from all walks of like. One could never fault the predictability of this one show either. As I began to watch more episodes, Nan would explain to me that the character of Sheridan Bucket was one that we would never see. Yet Patricia’s delivery in her “phone conversations” painted a clear picture that he might have been the victim of an over-bearing parent with no clear direction in life. In a similar analysis, the character of Onslow (brilliantly portrayed by Geoffrey Hughes) was an unemployed good for nothing intellect. He was content to live with his potato crisps and cold beer while continually turning down the advances of his spouse. Nan probably never realized that drawing me to this style of humour would have a tremendous impact. Many close to me will say that I can find almost anything funny. So perhaps taking in this kind of material and really studying it, is a good way to refine how my words end up sounding or looking. No matter who and what I am writing them for. I remain grateful that Nan was still around long enough to read and hear about the trial and tribulation of my first paid newspaper writing gig. Posted in Notes from the Frogpond.Tagged Are you Being Served?, Britcoms, British Sketch Comedy, Dann Alexander, Keeping Up Appearances, Monty Python, Nan, Patricia Routledge, situation comedy, writing.